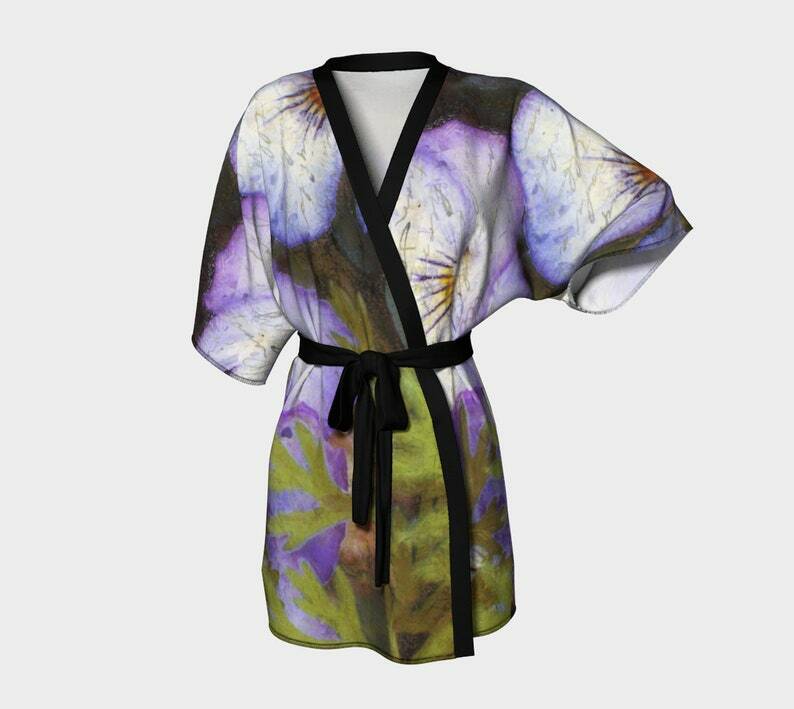 Artwork paired with luxury in this line of kimonos. Dramatic, elegant look. Perfect for special occasions, gallery shows and festivals, evenings or lounging, yoga wrap over leggings or after bath. This design is "Pretty Vintage Pansies" with soft purple Pansy and Violet Flowers and green shades of leaves. Great for pool parties, gifts for sisters, girlfriends, gifts for a new Mom or travel robe or Beach cover up. Fun for bridesmaids as a colorful keepsake with art from Canadian artist Claire Bull. Matching Skirts, hats, Robes available. See my listings. This is a custom made item with my artwork, created when you order it. Once the order is placed, manufacturing begins and each item is made to order. Images are as accurate as possible but monitors vary. The items are Canadian made with attention to detail and environmentally friendly products. Art meets Fashion through creativity and passion.